vegetarian | This Girl’s Gotta Eat! I’m a sucker for a good bowl of chili, especially on a cold fall night. 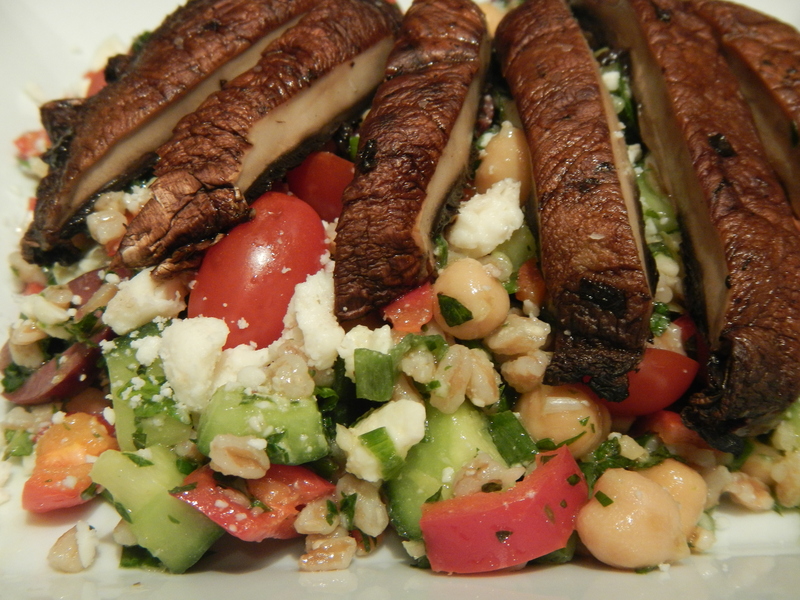 Tonight fit the bill for me to try this vegetarian spin on a hearty classic. This chili is just as delicious and filling, but I didn’t miss the meat….give it a try and see for yourself! 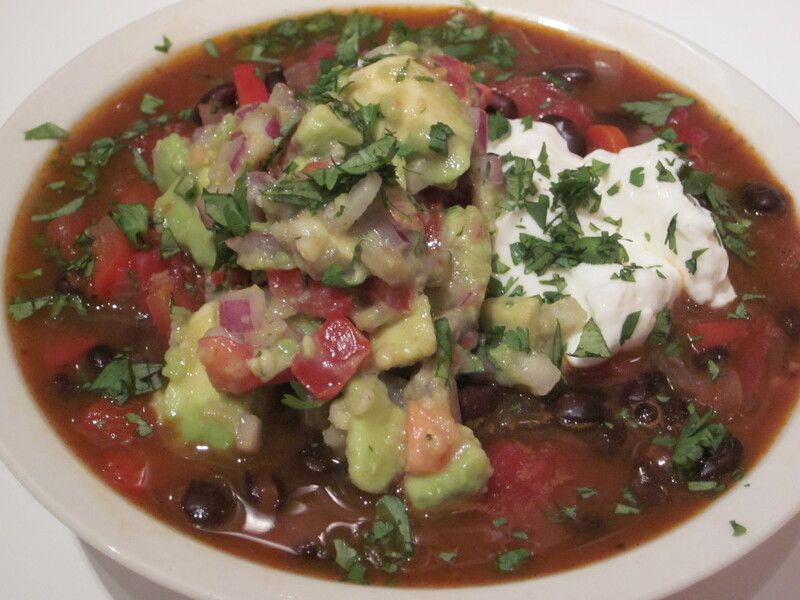 In a large bowl, combine the avocado, tomato, onion, garlic, cilantro, lime juice, cumin and pepper. Lightly toss and let stand for 30 minutes. While the salsa stands, make the chili. Heat the oil in a large pot over medium-high heat. Add the onion and bell pepper and cook, stirring frequently, for 3 minutes. Add the beans, tomatoes (with juice), broth, chile peppers, chili powder, garlic, cumin and oregano and simmer for 20 minutes. Serve with the avocado salsa, sour cream and lime wedges. Sprinkle with cilantro. We enjoyed a Greek festival this weekend, which kicked off at a house party with Greek appetizers and drinks. I brought this deliciously fresh Greek salad which was a perfect complement to the other goodies we feasted on. Opa! 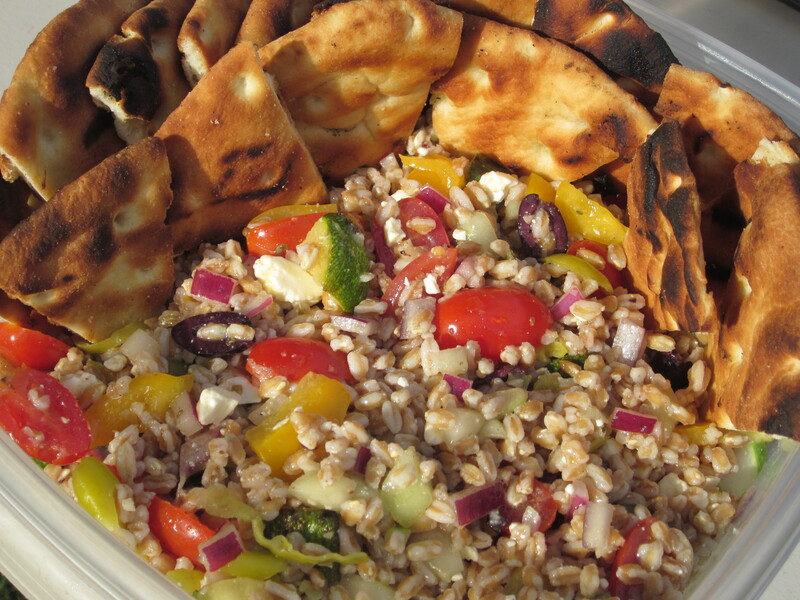 I had never cooked with farro, but now I can say I have! It’s a hearty ancient European grain with a nutty flavor. You can either find it in the ethnic food aisle or at a local import market, which is where I found it. Make sure to buy the semi-pearled kind since it requires less work and cooks faster. To make the red wine vinaigrette: Whisk together 1/3 cup olive oil, 3 Tbsp red wine vinegar, 1 Tbsp minced fresh garlic, and 2 tsp dijon mustard in a small bowl. Season with salt and pepper to taste. Prepare farro according to package directions, then rinse and drain. In my case, the package I used didn’t have good directions. So I cooked the farro in a pot of salted boiling water for about 13-14 minutes (thanks Google!). Brush zucchini and pitas with some of the red wine vinaigrette. Grill zucchini, covered, until tender, 5 minutes. Grill pitas until toasted, and lemons until browned. Remove from grill and let cool. Once cool enough to handle, dice zucchini. Combine tomatoes, cucumber, bell pepper, feta, pepperoncini, olives and onion in a large bowl. Add farra, diced zucchini and remaining vinaigrette; toss to coat. Cut pita into wedges and add to salad. Serve with lemon halves – or add the juice of the lemons right to the salad, which is what I did. Preheat oven to 400 degrees. Slice eggplant and zucchini horizontally (aim to get the same size pieces as the lasagna noodles), toss with olive oil, salt and pepper to coat and arrange in a single layer on baking sheets. Roast in the oven for about 25 minutes, turning half way through. While the veggies are roasting, work on the sauce. Remove veggies when done and turn the oven down to 375 degrees. Heat the oil in a medium saucepan over medium-high heat. Add the onions and cook, stirring, until soft and slightly browned, about 3-5 minutes. Add the garlic and cook for 30 seconds (be sure to stir garlic when adding so it doesn’t burn in the hot pan). Add the tomatoes and thyme. Season with salt and crushed red pepper, and cook about 5 minutes, stirring frequently. Add the chicken broth and tomato paste, bring to a boil, and cook until reduced a little and starting to thicken. Add the cream and cook until reduced by some more, or until thick enough to coat the back of a spoon. Add the butter, basil and parsley and stir to combine. Remove the thyme sprigs (if you used fresh thyme). Taste and adjust the seasoning and consistency if necessary. 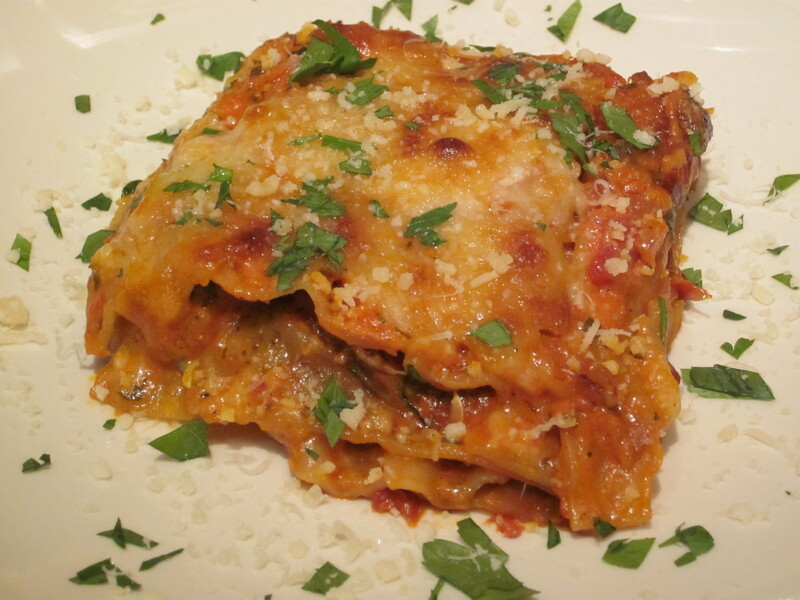 To build the lasagna, spread a little sauce on the bottom of a prepared 9 x 13 baking dish. Next, lay 4 slices of lasagna on top of the sauce all in one direction. Top with some mozzarella cheese. Then add a layer of roasted veggies, followed by a layer of sauce and parmesan cheese. Add another layer of 4 noodles, this time all in the opposite direction as the first layer of noodles. Top with some mozzarella cheese, then a final layer of roasted veggies, a layer of sauce and a layer of parmesan cheese. Add the final layer of 4 noodles, all in the same direction you started. Top with the remaining sauce and a final layer of mozzarella cheese. Be careful not to use all the sauce up in the beginning of layer, parcel out so you’ll have enough throughout. Cover with foil and bake at 375 for 30 minutes. Remove foil and bake uncovered for another 10 – 15 minutes or until cheese is melted and browned. Let stand 5 minutes before serving. Garish with more parmesan and fresh parsley or basil. This is a hearty vegetarian supper that will now be part of my go-to recipe collection, thanks to Martha and her gang at Everyday Food! Tons of great flavor and easy to make, what more could you ask for! Cut about 1 cup of cauliflower florets from a head of cauliflower and toss with olive oil, salt and garlic powder on a baking sheet. If you like a little heat like I do, sprinkle some cayenne pepper on there too! Roast for 25 minutes, turning once. Remove and set aside until it’s time to add the cauliflower to the chickpeas. Meanwhile, in a medium pot, heat oil over medium-high. Add onion and cook, stirring occasionally, until golden brown, about 10 minutes. Add garlic, ginger and curry powder and cook, stirring, until fragrant, 1 minute. Add chickpeas and 2 cups water (I substituted chicken broth to give some extra flavor), bring to a boil over high heat. 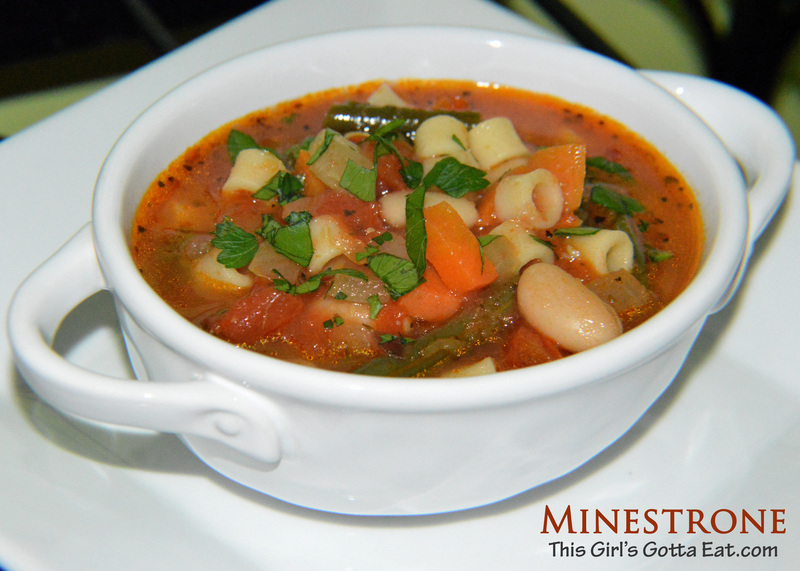 Reduce heat to medium, cover, and gently simmer 8 minutes. Add cauliflower and cook until chickpeas are tender, about another 8 minutes. Stir in spinach and cilantro and season with salt. Cook your rice when your chickpeas start to boil so both are ready at the same time. Cook rice according to package instructions. Instead of water like the instructions call for, try using chicken broth instead. I also added a dried bay leaf and sprinkled in some curry powder just before boiling to tie in the flavor from the chickpeas. 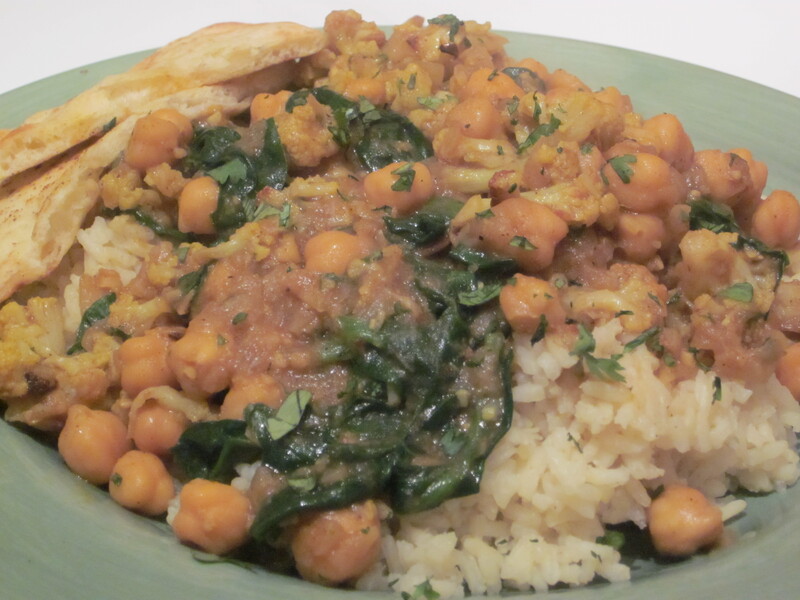 To serve, divide rice among plates or bowls and top with chickpea curry. I also warmed up some garlic naan bread (brush naan with a little olive oil and back 3-5 minutes at 400 degrees until warmed) and served along side.